Senator Bob Corker and Congressmen Mike Rogers and Mike McCaul have no business holding any position in a Trump administration if Mr. Trump actually wants to defeat the Jihadi Movement in the United States. All three of these men have records of defending jihadis and lashing out at those who speak truth about the real threat from the massive jihadi network in America. All three are being considered for positions inside President-elect Trump’s administration. 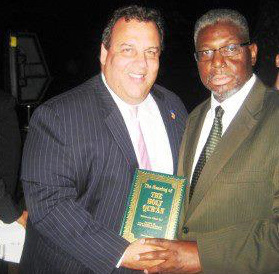 We can all celebrate the fact Mr. Trump punted jihadi-loving Chris Christie out the door. Several more to go. Senator Bob Corker (TN) is the reason the “Iran deal” became a reality, and demonstrates zero understanding of the Islamic threat at any level. His sidekick, Bill Hagerty, has a relationship with Subhi Ali, the former President of the Tennessee Medical Association. Ali served at the pro-Hamas Jerusalem Fund as the Vice Chair alongside Founder and Chairman Hisham Shirabi (now deceased). Shirabi served on the Board of the Hamas organization World and Islam Studies Enterprise founded by Hamas leader Sami al-Arian. Subhi Ali is now the Chairman of the Jerusalem Fund which has the Hamas Covenant on its website. UTT’s John Guandolo personally briefed the threat to Mr. Rogers, so he cannot claim ignorance. 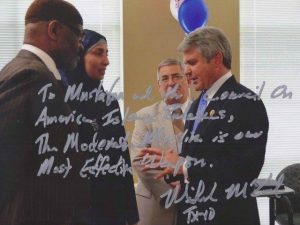 As a side note, Congressman McCaul also thinks Hamas (doing business as CAIR) is a “moderate” organization. The photo above shows McCaul with Dallas, Texas Hamas leader Mustafa Carroll. Is this who you want as your next DHS Secretary America? America, the election of Mr. Trump only provides the OPPORTUNITY to dismantle the jihadi network in the United States. If he surrounds himself with proven incompetents like those mentioned in this article, we will have 4 more years of destructive “outreach” to terrorists and counterterrorism policies that will only benefit our enemies. What can you do? Reach out to any contacts you have at the state or national level inside the Trump camp and say “NO!” to the likes of Corker, McCaul, Rogers or anyone else like them whose name comes up in discussion for a leadership position. At a minimum go to www.donaldjtrump.com, find your STATE, contact the closest Republican Headquarters, and make your voice heard on this issue. It does not matter to which political party you belong. Your voice matters. The next 30 days is critical to get the right people in the right positions. Do not sit on your hands celebrating what you think is THE victory. Bob Corker will either challenge a Trump 2nd term in 2020 or vie for the Republican presidential nomination among whoever else does (I.e., there are 25 other possibilities listed on Wikipedia under “United States presidential election, 2020”). Furthermore, anyone who doubts the Senator’s expectation of success regarding said plan is predicated on a promise of Islamic sub-rosa funding (in addition to his flirtation with treason in behalf of Iran) should read the Fox News article by Diane Macedo dated 09Aug10 entitled “Plans to Build Massive Islamic Centers Raise Concerns in Tennessee”; and also touch base with Steven Emerson of “The Investigative Report” with respect to relevant Hamas members and others. Corker knows that his sharia-adherent political benefactors pose an existential threat to American survival, but like the rest of the quislings abroad in the country, Corker don’t care. According to Article1, section 4, paragraph 2 of the Constitution, Congress is only required to show up for work one day a year – customarily the third Monday of December, probably so chosen to enable members to exchange Christmas gifts and sip a bourbon & branch water before going home. If the ludicrously dubbed “lawmakers” would adhere to their own rules, therefore, and stay the hell out of Washington for the remaining 364 days of each year, Texas Congressman McCaul’s role as “cheerleader” for the Muslim Brotherhood’s “Countering Violent Extremism” scam on behalf of his ostensibly beloved global hoard of sharia-adherent killers, could be relegated to an ad hoc committee of DEPLORABLES dedicated to the welfare & safety of the American people who – unlike McCaul and his class – lack the benefit of a daily existence amid multiple concentric circles of high-tech security. The Trump Administration couldn’t be considering a worse choice for press secretary than Laura Ingraham, who along with Fox News personalities Bill O’Reilly, Meghan Kelly and Greta van Susteren quickly denounced Pamela Geller on-air for the ISIS associated Islamist terrorist attack she survived during a well publicized “Mohammad cartoon” contest in Garland Texas. And had it not been for the quick intervention of the FBI & local law-enforcement, several contestants and viewers, in addition to Geller, would have also been threatened with death.. Furthermore, in view of Ingraham’s demonstrable willingness to have effectively painted an indelible “fatwa” target on Pamela Geller’s back, any semblance of transparency and credibility the President elect plans to establish by virtue of Q & A sessions between his press secretary and the global media, could be totally destroyed, or consistently rendered fragile at best, with one simple threshold question, I.e. “do you (thus the administration) still support the perpetrators of Islamist jihadi attacks, as opposed to their victims?”. We don’t want a Jihad lover in our white house, we have to attack this from all sides even in our white house, I know there are 4 or 5 in our white house, get rid of them,we fought to hard for you MR.PRESIDENT, THERE A DANGER TO OUR COUNTRY. We don’t need these people in our white house, they need to go there to dangerous to our country. No suppositional comparison poses a more lethal threat to the life of the President and his immediate family et al than does their front-row, relatively stationary, attendance viewing the traditional inaugural parade passing along Pennsylvania Avenue, in front of the White House, following the swearing-in ceremony at the Capitol. Having worked rank & file inaugural assignments a number of times, thus am aware of the near limitless exposure said dignitaries perforce will be facing, the following reminders of PREVENTABLE assassinations should not be ignored: a) Lee Harvey Oswald was ostensibly being surveilled 24-7 by a Special Agent of the FBI, yet John F Kennedy was murdered; b) Abraham Lincoln’s presidential box at the Ford’s theatre on 10th Street was ostensibly being guarded by a member of the Metropolitan Police Department, when he was wounded by Booth (and died the next morning in the Peterson house, across the Street). And, with respect to worrying similarities, on 08 October 1981, President Anwar Sadat of Egypt, while sitting relatively still – IN A REVIEWING STAND – parallel to the path of passing contingents of an annual victory parade, in Cairo, was ASSASSINATED by members of the Egyptian Islamic Jihad acting on a “fatwa” obtained from Omar Abdel Rahman who was later convicted in the United States for the role he played in the 1993 World Trade Center bombing. I.e., any member of a security team who tends to transition from being a lifeguard to becoming a spectator is in the wrong line of work, and should be replaced. The on-going hub-and-spoke criminal conspiracy involving 200 “sanctuary cities” in 32 States under the control of political felons who refer to themselves as “Governors & Mayors” does not constitute any semblance of a civil, or other “rights” movement, but is instead a well funded, violent illegal-alien INVASION tactically contrived by Marxist, anarchist and Muslim Brotherhood operatives for the express purpose of supplanting the U.S. Constitutional government with the draconian hell known as “Sharia”. Furthermore, since Article 4, section 4 of the Constitution GUARANTEES to every State in the union protection against invasion, and domestic violence as well – I.e. given that the longer the chain, the thinner the links – it would only require but a few Part-1 solid indictments to bring about their total collapse and concomitant exposure to the American people regarding a variety of nefarious intentions and (more importantly) the lethal dangers they pose, mainly to women, children and the elderly on the streets of their familiar home-towns and cities. live their entire lives amid multiple concentric circles of high-tech security, as do their families and inner circle of friends I.e., while your children, including the toddlers, are being effectively exposed by said scum to literal bloodthirsty savages. Given a report coming out of Minneapolis-Saint Paul that consequent of a 5-3 planning board margin the Governor there has decided (in the interest of greater “diversity”) to forbid the exhibition of U.S. Civil War art in his Reception Room, it would appear that with respect to maligning American history, catering to sharia-adherent, thus notoriously dangerous, Somali Muslims and defying federal authority relating to Article 4, section 4 of the United States Constitution, Minnesota is incrementally morphing into a gift that keeps giving. I.e., thanks to the Kenyan born Islamist impostor who during the elapsing eight-year interregnum (I.e., period during which the normal functions of government control are suspended) has relied on demonstrably counterfeit documents comprised of an Hawaiian birth certificate and Selective Service “draft card” to legitimate his fraudulent usurpation of the U.S. Presidency in order to establish a tyrannical plutocracy – thus embark from day-1 on a lethal & costly vengeance-driven racial vendetta – 6 Somali organizations in Minnesota have shared in a $300K federal grant used to (effectively) pay Somalis for not increasing the exorbitant number of crimes they already commit in the twin-cities, nor submitting to jihadi-terrorist recruitment overtures of embedded Muslim Brotherhood entities et al.